Christmas is widely considered to be a “feel good” holiday. Togetherness, family and friends, food and drinks, gift exchanges and no work for at least a few days. If that is the case, then why are some of the most excellent holiday movies also the darkest? Holidays don’t always hit everyone in the same way. Sometimes they are lonely and cold. Sometimes the family that you have been given is not the family that you feel comfortable with. It is at times like this that the acidic-but-comedic warmth of A Christmas Story (Bob Clark, 1983) isn’t as welcome as the hard-edged film noir of Blast of Silence (Allan Baron, 1961). This holiday season, the New Beverly is proud to present one of the most incredibly exciting double features that you could hope to see the night before Christmas: crime thriller The Silent Partner (Daryl Duke, 1978) and the action-packed Die Hard (John McTiernan, 1988). Forget that patience you used to have for Santa and his reindeer, your adrenaline will be too high after this show! Patience schmatience! While Die Hard is considered to be a classic of action cinema and has been a well-loved Christmas movie for many years, I would like to take an opportunity now to consider why it is not the typical action film and why that makes it considerably better as an action film and as a holiday film. When we examine Bruce Willis as an action hero, we do not see him as the same kind of masculine figure that we do most other men in physically combative films. There is always something a little more vulnerable about him. This is the crux of Die Hard and why the film works so well. John McClane (Bruce Willis) is a good New York cop and a dedicated family man. OK, that last part is a little complicated. His wife Holly (Bonnie Bedelia) gets a good job in California but John does not accompany her because he believes that she’s going to fail and come crawling back within a few months. When this, of course, does not happen, McClane sees that he may have made a mistake. Holly then invites him out to California for Christmas, summarily to see the kids but clearly also to re-evaluate their relationship. As they begin these discussions in the bathroom of her offices during her company Christmas party, European thugs carrying excessive quantities of explosives and machine guns break in, headed by Hans Gruber (Alan Rickman), a leader who has a penchant for hostage-taking and a skill for high-level burglary. All hell breaks loose. 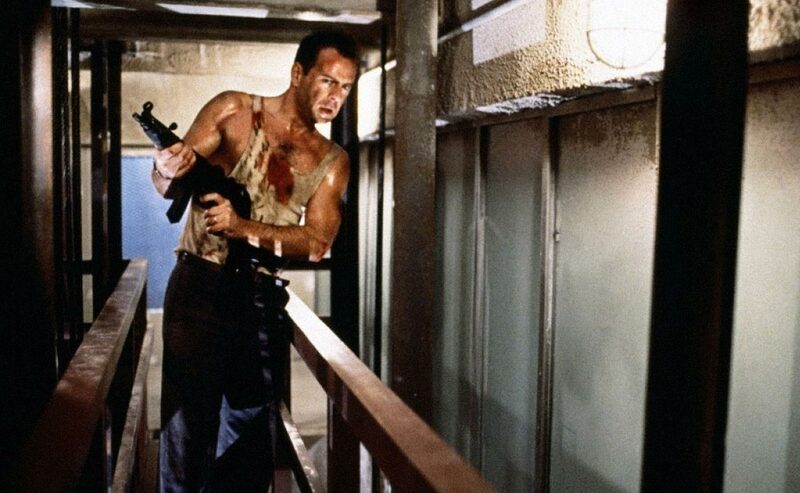 McClane manages to escape and the film proceeds from there, becoming a true testament to excitement, adventure and action. What makes Die Hard so cinematically valuable is its portrayal of the male protagonist and how he comes to terms with his masculinity. The character of John McClane is certainly an action hero, but unlike most of his contemporaries, he does not exist under the pretense of the “lookit me, I’m badass, gonna live forever, ‘cuz I’m an action hero” clause. The charm and bewildering singularity of Die Hard‘s hero is that, while he may be a cop (and a very smart and resourceful one at that), he doesn’t think he’s going to live forever. 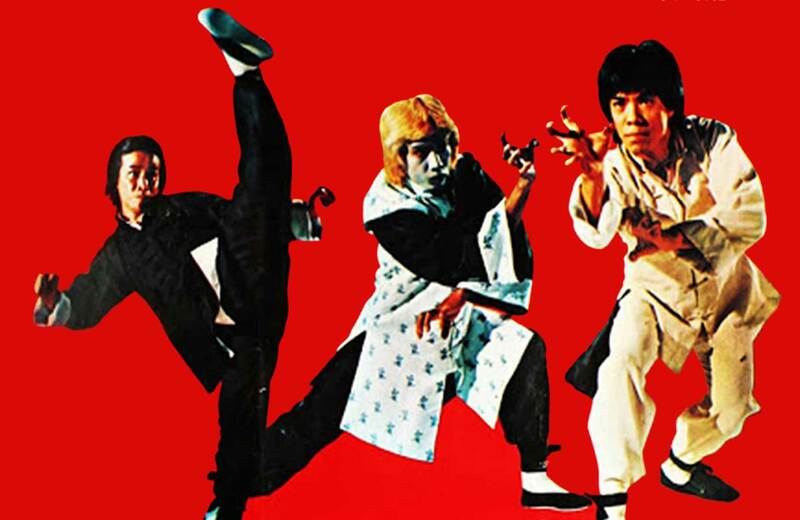 It is this conceit and the revelation of his flawed masculinity that enriches his character and fleshes it out, strengthening the bond between audience and protagonist. Towards the end of the picture, we see McClane in one of the bathrooms of the Nakatomi Plaza high-rise building that has been brutalized about as much as he has been. Beaten, wounded, literally almost naked and bleeding from a variety of different places on his body (most notably his bare feet), he makes a plea to Al (Reginald Vel Johnson), the police officer on the ground with whom he has developed a relationship with throughout the film. John McClane is seriously injured. He’s not pulling a “Chuck Norris” or “Steven Seagal,” which would consist of physically reflecting the injury but not registering it to the audience. That would reveal weakness, which neither of those action heroes generally does – it’s not in their hero narrative. 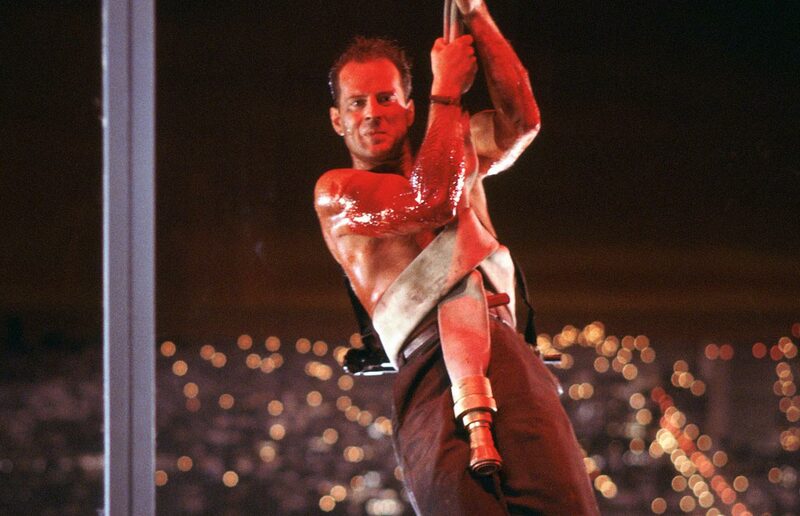 In fact, McClane is bleeding more in this scene than he has at any other point in the film and has lost almost every protective covering on his body, including shoes. Bruce Willis conveys a huge shift in the character of John McClane to the audience in this scene and it is emotional and almost shocking to see. 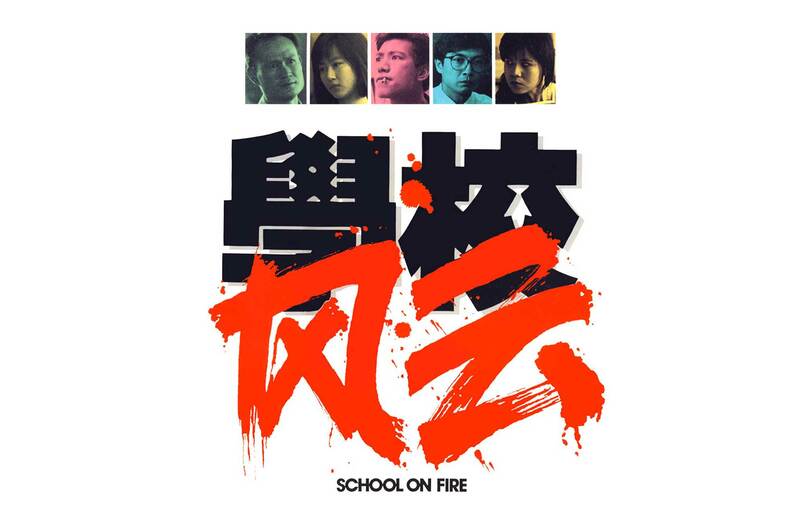 It is certainly not what you would expect for an action movie in 1988. He details how his performed masculinity has hurt him, even though we have just watched it assist him in a multiplicity of ways during the film. 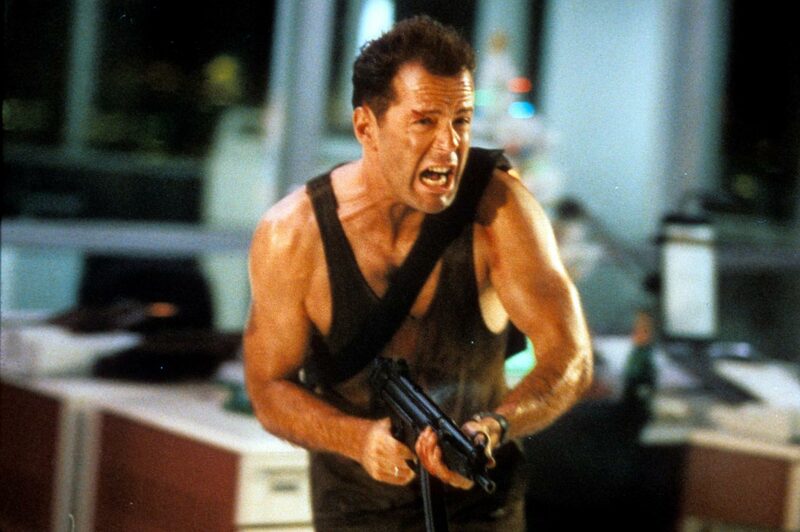 Previous scenes have shown his physical strength and raw ability to survive and protect but this scene has McClane describing his lived experience of being a Real Man, with all its flaws and imperfections. His face reveals that he is in possibly the most staggering pain of his life – physically because he is wounded and mentally because he is unsure if he will come out of this situation alive in order to make up for the damage that he has caused the woman he loves. The idea of the Real Man is upturned in this one devastating bathroom scene with some excellent dialogue. The best thing about subversive Christmas films is that they endure. Works such as Gremlins (Joe Dante, 1984), Black Christmas (Bob Clark, 1974), The Apartment (Billy Wilder, 1960) and this New Beverly double feature on Christmas Eve of The Silent Partner and Die Hard make the holidays full of joy, mirth and hope. And in a world like this, that’s the exact gift we need this season. Thanks again, New Bev for your presents(ce)!